YAK IS BACK!!!! And better than ever! 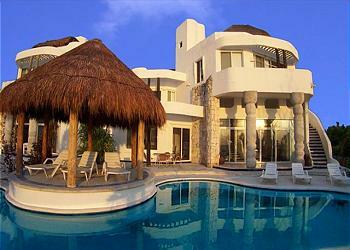 Villa Yak Alil is once again listed as one of At Home in Cozumel’s prestigious vacation rental homes. This amazing 5 bedroom, 4. 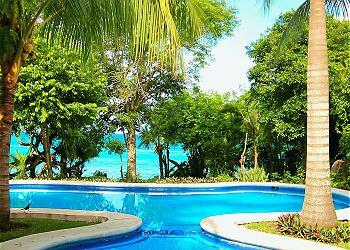 5 bath Villa is situated on a secluded sandy beach. The crystal blue Caribbean Sea and blazing colored sunsets will astound you whether you are on the third floor terrace, poolside, or sitting in the sand! This spacious home can accommodate 16 guests. The open and spacious layout includes several sitting areas to enjoy each other’s company or find some time for yourself. Have your morning coffee or afternoon Margarita on the third floor terrace, poolside, or on the beach. 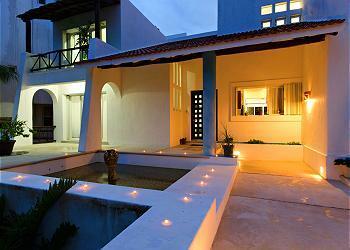 The owners take great pride in maintaining Villa Yak Alil to very high standards. The full time caretaker and groundskeepers ensure that the property is always well kept so that you can relax and enjoy. The house is very family friendly. On the ground floor you have 2 bedrooms, one with a king bed, sitting area and ocean view and one with a queen bed, mangrove view. These bedrooms share a bath on the main level and there is also a half bath on this level. On the second level you have 2 luxury suites, perfect for families. The first luxury suite has a king bed and a queen bed with an alcove that has 2 twin beds, a private bath. ocean view and sitting area. The second suite has a 2 queen beds with an alcove that has a double bed, private bath, ocean view and sitting area. Between these two suites is a sitting area with 2 futons and access to the oceanfront balcony for extra accommodations! On the 3rd level you have the luxury master suite with a king bed, sitting area, private bath. ocean view and private balcony. Directly in front of the Villa is the Tunich Reef, part of the second largest barrier reef in the world. Snorkel the crystal clear water, exercise, take out a kayak (2 on premise), play volleyball or just grab a cerveza and relax in a hammock. The choices are endless and yours to make! Cozumel boasts some of the best dive sights in the world. There is also an outdoor shower and dive room where you can rinse off and store your scuba gear. Another fantastic stay at Villa Yak'alil, everything was great. The cook service the property condition and the very attentive on-site staff all fantastic! This is the second time we have stayed at Villa Yak'alil. We love the location out of town a little ways and we love the fact that you can snorkel right off the house and see so much. Ernesto and Angelica were wonderful. Excellent property with tremendous staff. A wonderful experience from the moment we opened the front door. We had a group of ten and the house provided the perfect amount of space for everyone. Highly recommend the chef service as Lucy and Ester are excellent cooks. Jackie provided good recommendations and was a wonderful help. Ronaldo kept the grounds looking picture perfect everyday. We can't wait for the next 50th Birthday so we can all go back and enjoy this paradise once more! We enjoyed Yak'alil. It was our first stay after having visited it before. We had a large family and it was perfect. Rinaldo and Jackie were there every day cleaning inside and out and helping us with whatever we needed. They really have thought of everything from beverage coolers outside near the table and grill, wifi for the whole house, shade to escape the sun, hammocks, and a screened porch so we could still be outside if the bugs are too much, which they weren't. We had everything we needed to relax and let go. The home was picture perfect, our family stayed and there was plenty of room for 18. It was a out of town so you may want to rent a car but we had Miguel(taxi driver) and he was more then happy to drive for us and very helpful. Jackie and staff kept the house spotless and was also very helpful and available if needed. I would recommend this to anyone and would rent it again if ever returned to Cozumel. Loved our stay!!! We had a great time at the home in Cozumel. Our groundskeeper and housekeeper were phenomenal and kept the place in tip top shape. The accommodations were very spacious for our group of 14. The pool, hammocks, and the private beach were a very nice bonus. You will definitely need a car rental as daily taxi service to the downtown area can get very pricey. Our family will definitely be back. Superb villa accommodations, delightful scenery from the villa, great food and very and hard working staff. On the other side the other hand the rai brought a lot of bugs and isolation of the villa necessitates having a car which we did not get. This house is south of town, giving you a feeling of seclusion, but it's only a short drive to town. Highly recommend cook service, lots of great food! Ask for Lucy! Jackie does a great job of keeping the house clean & well maintained. Renaldo keeps the grounds emaculate. The house is accurately described, there were 10 of us 6 adults & 4 children, we had lots of room. Beach is a little rocky & boat activity comes fairly close, making snorkeling in front of the house not very desirable. Everyone enjoyed kayaks, volleyball & beach combing. There were 16 of us - grandparents, parents and grandchildren. 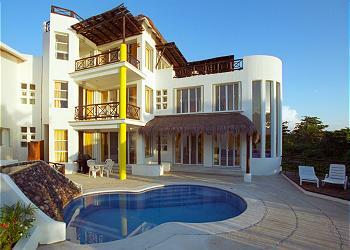 We have been to Cozumel often and have stayed at several villas. Yak'alil was perfect for our group. All the staff were great. Jackie was very helpful and the cooks Alex and Alesha were wonderful - Alex took time to visit with our grandchildren. something they will never forget. they so wanted to know everything about Cozumel, and he was very interested in life in the U.S. Great time was had by all. From booking, including our questions all answered, and arrival and stay the Villa was perfect choice. I've stayed in a handful of tropical villas, and while I enjoyed them all, when it comes to the ultimate beach house, it doesn't get better than this! The house is better than the photos convey. All bedrooms are pretty balanced, either having a great view/room or a great bathroom. The main floor and top floor bedrooms have lesser bathrooms, but the second floor bedrooms don't have the balconies and walk-out deck the others do. The exception is the small bedroom on the main floor with no en suite bathroom at all. The house was well-kept, both inside and out. Jackie and Reynaldo do a fabulous job keeping everything clean and tidy. Lucy's food was excellent! We especially liked the pumpkin cream soup. Our activities through the week included visiting Chichen Itza, Massages at the house, Superbowl at Alberto's, food and drinks at many beach bars, Punto Sur, and I highly recommend a snorkeling trip to El Cielo where swam with nurse sharks, sting rays, barracuda, morray eels, lobsters, starfish and many tropical fish. I recommend renting a car or two when staying at Yak'alil. It's not far from town, but gives you much more freedom to explore, run to the store and airport as needed. It's expensive because of the mandatory insurance, but it was worth it. I would highly recommend Villa Yak'alil to anyone, but especially large groups looking for plenty of room in an unbeatable ocean house! Overall our stay was excellent. The staff was wonderful, kind, and Jackie was very helpful. We loved the house, the volleyball court, and the snorkeling. One suggestion would be maybe a separate kids menu - so they wouldn't waste as much food and would maybe eat more. We had a fabulous stay at Villa Yak Alil in August 2014. We went to celebrate my 40th bday with family and friends with a total of 14. There was plenty of beds and space for everyone. When we arrived the home was even better than expected from the photos. Snorkeling just outside the house was even better than the snorkeling trip we took. The kids played in the pool for hours and the staff was very accommodating. The food was the biggest treat of all. It was delicious and so nice to not have to cook or clean. I would suggest getting the chef for sure. It is a bit of a drive to the main town but that was a plus because it felt very safe and secure. It also made if very peaceful and relaxing being away from all the hustle and bustle. The only problems were that only one kayak was working and none of the water bikes worked at all. Also the wifi barely worked. I think this was a temporary problem but many of us were frustrated with not being able to check emails. This was the first large family vacation we've done. We had 10 people in our group and this house had plenty of room for us. Everything was amazing about our vacation. Jackie worked very hard to keep the house neat and tidy. Reynaldo made sure the outside was in order each morning. He took time to one coconuts for our kids and they thought that was awesome. Lucy and Norma cooked for us and all of the meals were delicious. The snorkeling from the beach was awesome. It is best to go just after sunrise before the tour boats start running. We saw a reef tip shark, barracudas, needle nose fish, several types of conch, starfish, and lots of colorful fish. The highlight of our day was sitting near the beach and watching the sunset and seeing if we could catch a glimpse of the alligator as he swam by at night. We weren't really sure what to expect from a vacation rental, but Villa Yak Alil far surpassed our expectations. I can't wait until we can go back. Our stay at Yak'alil was fabulous! The house is perfect for a large family (we had 15) and the outdoor space is private, inviting and entertaining. Jackie did a great job keeping the house clean and in order during our stay and helped us with transportation and even finding a doctor when we had to make in unexpected trip. Reynaldo kept the grounds and outdoor space beautiful and went above and beyond to help our family enjoy vacation by splitting coconuts for the kids, lighting a bonfire and teaching a couple of the kids how to fish. I highly recommend the food service. Norma and Lucy made us the most amazing dishes and were very flexible with the times. We always had leftovers to snack on throughout the day! My only less positive comments is that we thought there was a washer and dryer available for guest use by the way it is advertised, and there is not. Jackie was kind enough to do a couple of loads of laundry for us, but we would have packed differently had we been aware of that. It is about 20 minutes from town so with a large party taxi rental is expensive, but Miguel and Miguel drove for us the entire 2 weeks and helped us tremendously. They made reservations for us, gave tips on the ferry, grocery shopped with us to help navigate the store and even translated at the doctor! Well worth the money! We hope to return to this beautiful home with endless views! Once again, Yak'alil was a great choice. This was our second time in the home and I highly recommend it to everyone. The management and staff were very accommodating and the cooks were perfect. The Coz Crew has been coming to Cozumel for 12 years. We have had as many as 26 people in our group. This year we had 8. This house was absolutely perfect for our group. It was set on a private beach with direct beach access. The volleyball net/court was amazing to have ready to go all the time. The pool was a little small, but a perfect size for the house. The grounds were immaculately kept. Renaldo did a wonderful job at keeping everything outside perfect. The inside of the house was immaculate. Jackie does an amazing job at keeping the house clean and perfect. She is very helpful and fun to talk to. Jackie is amazing!! The kitchen is huge and setup perfect. All of the bedrooms were amazing with their own special touches. They were all clean and huge! Each one had great water pressure in the showers with hot water and there was bottled water on each floor. (The only exception is the small 5th bedroom) 4 of the five bedrooms are perfect for couples and 2 are great for a family to stay in. The only complaint someone could have about the bedrooms is the 5th bedroom. It is very small and only has a double bed. There is no bathroom or view for that bedroom. This didn't bother us at all because we only had 4 couples and we didn't use that bedroom. That is the only thing I would say be careful with- the 5th bedroom. Other than that the house is perfect, clean and amazing. Jackie and Renaldo do an excellent job of keeping the house and grounds clean and Jackie is great to talk to and she is willing to help in anyway she can. Our vacation was perfect. Our family vacation was both fun and relaxing thanks to the wonderful staff at the house. Reynaldo spent extra time with our grandsons showing them how he cut open coconuts to drink the water. His groundskeeping was fantastic and he managed to keep the pool and beach spotless each day. The cook staff, Lucy and Norma, are nothing less than phenomenal. The meals were prepared professionally and always on time - and they tasted great. Always had left-overs for late night munchies. Jackie did a great job keeping the inside of the house clean and comfortable, she was even willing to do a few loads of laundry for us. All-in-all we had just what we hoped for; well needed family time to relax and enjoy the beautiful waters and weather of Cozumel. We had a group of 12. Everyone could find plenty to do. There is snorkeling right in from of the Villa. The kayaks and Volleyball court were used everyday. Jackie is wonderful and took care of anything we needed. The cooks Lucy and Norma made amazing meals that exceeded our expectations. This place has something for everyone. We had a great time and would recommend to anyone who enjoys the beach. Just fabulous all around! The staff was amazing especially Jackie, she kept things clean and tidy and she was always very helpful. As for the cooks, Norma and Lucy, they were amazing and very accommodating with food choices for the adults and children. We plan to return again. Villa Yak'alil was nearly the ideal rental for our April birthday get together. The house is large enough that our party of 12 never felt crowded. Jackie took care of any problem we had including cleaning the kitchen every day. The internet service was fast enough for www.damselindior to keep current on her latest blogs. Our kids enjoyed the two kayaks and I kept the bbq pit smoking. My only complaint is that the shallow water extends too far from shore for the dive boat to pick you up in front of the place. Instead we met at a pier just down the road. Each bedroom has it's own air conditioning controls and kept everyone cool. Plenty of hot and cold water in the bathrooms. We had trouble with one shower head and it was fixed as soon as I pointed it out. I highly recommend trying this place out. We plan to return next April. Fantastic. Villa yak is one of the very best. Jackie and the rest of the help around the house were super. The sunsets were incredible . The house is right on the beach with greate snorkeling and dive boats came very near because it was great. Best location on island. Very quiet and just minutes from town. Villa yak deserves all 5 stars. I just hit the button wrong if it shows less You won't find a better place. This was an amazing vacation, the home was absolutely beautiful and went far above what we could have even imagined. Jackie took care of the home spotlessly and went far above her duties, she was very helpful, contacted taxi's for us, helped us know different things to do and where to go, she always made sure everything was clean. We loved her. This vacation spot is wonderful. We would highly recommend this home to others. We hope that we can return sometime. It was amazing!!! Once a year we take a week to go diving in Cozumel. We have tried everything from traditional hotels and dive resorts to waterfront condos, but Villa Yak a Lil surpassed all previous stays. The villa is situated on a private beach away from the sounds of busy hotels or other properties. We were taken by the courteous staff, the spaciousness of the home, the ample resting areas by the pool or shady hammocks. Each room has a beautiful view of the beach each with its own balcony or one nearby. We can't wait to visit villa Yak a Lil on our next visit and would highly recommend it for a group of friends or family traveling to Cozumel. Had nine wonderful days in this huge, comfortable house. Cook service was exceptional, Jackie, the housekeeper couldn't have been kinder or more helpful. Weather was perfect, beach and snorkeling so convenient. Room for everyone, spacious bathrooms, spotlessly clean. Any problems solved by Miss Jackie. Edgar, the cook went out of his way to accomodate picky eaters and vegans. Garage space for your vehicles, games and cards available. Large porch and deck and spotless infinity pool. Once in a lifetime trip for our three generations. Would return in a heartbeat. you can be separated from everyone and have some me time. We paid for the cook service and we bought food for the lunch part of the day. However, we had so much good food left over from breakfast and dinner sometimes that we would not even need to make lunch. We had a group of 15 friends at the villa for the week. We were celebrating a 40th and 45th birthday for two of the ladies and the place was so beautiful that a couple that was getting married in the states in January decided to go ahead and get married there at the villa instead. We had a really great time and after the week was over it was hard to leave our home in Cozumel behind. The only comment I heard that may be improved on is that a few of the people said that their mattress was uncomfortable (hard). This was not my opinion though, I slept in the third floor bedroom and it was great. There is a beautiful roof top veranda but there is no furniture on it to sit out and enjoy sunrises with a cup of coffee and sunsets with a glass of wine, it needs to be furnished so that you don't have to bring the furniture from the bedroom outside. We would definately recommend this villa to anyone looking for a place in Cozumel, in fact we did just that to a couple that we met at the airport on the way home. LIFE IS GOOD!!! This was a perfect place for the wedding party to stay! Lots of memories were made here. It was so convenient to Mr. Sancho's (where the wedding was) and to the Iberostar (where all of the guests stayed). It was really nice to have our private pool on the beach! I highly recommend it!! Dr. Bergman enjoyed his stay very much. we loved the spacious house, use of Kayaks, hammocks, pool, and location. Would definitely return. Outstanding facility and staff. I can't recommend the Villa Yak Alil highly enough. If you want a beautiful home with your own beach access along with very helpful staff this is the perfect place. Had a wonderful stay at Villa Yak'alil! The on site caretakers Jackie and David kept the house and grounds clean and were most helpful with anything else we needed. We used the cook service and can't say enough about how good it was. We are definitely planning a return trip in the near future. We've stayed in numerous villas in Mexico and this is the best kept place . The manager ws very helpful and the cooks were awesome. Kids rode the water bikesand kayaks daily. They rode next to dolphins with a baby on the last day. Great ending to a great vacation. The house was much better than depicted in the photos available online. Anyone looking for a relaxing time on the beach will love it. Great for large families or multiple familes. The cooking service was well worth the additional money. Great time at Villa Yak'alil - 3/13 thru 3/20. Villa Yak'alil is wonderfully spacious and elegant. A great accommodation for our family of 8 adults and 4 childen. 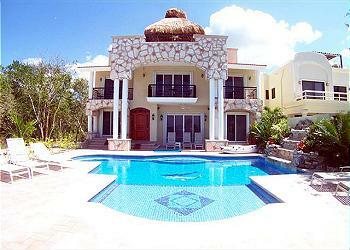 Cozumel is a great destination, and the villa exceeded all expectations. Jacqui took very good care of everybody and everything. What an incredible trip! Thank you so much to Jackie who made everything so easy on my family! We would have liked to have had an oven or a grill, but other than that it was an absolutely wonderful time! Second time to this property. New owners have made significant changes/upgrades making this our best trip yet to the island. Everything was superb!!! Our whole clan (11 of us) enjoyed our week at Yak'alil very much. It was the best of the 3 Villas we have used. Jackie was the best ever. The villa and staff were outstanding! The beach was beautiful and within close proximity to several public beaches. I highly recommend this property (especially the cooks!)! One complaint was broken beach chairs but that was easy to overcome. We will be back. EXCELLENT! Would go back anytime!!!!!!!!!!! Jackie was amazing, 5 stars doesn't begin to accurately charectorize how helpful, attentive and kind she was. Anything we needed she provided and gave us ideas and resources we hadn't thought of. Our stay wouldn't have been the same without her. I have to say you never know exactly what you might be getting yourself into when booking a vacation home online. But I have to say that this house was everything they said it would be and more. From the moment we arrived we treated like family. Jackie who lives on the property and takes care of the house was so amazing. She will make your stay in Cozumel a better experience. She kept the house so clean and was always there when we needed her. There were 10 of who stayed at the house. We had more than enough room. One of the highlights of the trip was our cook Luis. I highly recommend having a cook for the house. Everyday he was there bright and early making us an amazing breakfast. Then would be back at anytime you wanted to make us dinner. He always had such a big smile on his face. ALso many of us were diving on the trip. There is a pier within walking distance of the house that your dive company could pick us up at and drop us off at after the dive. So to sum it up. We all had such a blast staying at Villa Yak'all. We will be back there again very soon. I love Cozumel! Locals are fantastic and their is so much to see and do. This is my 2nd booking with at home in Cozumel & both have exceeded my expectations. The Yak Allil was fabulous, I'm amazed at how cheap it is to rent a house of the caliber!!! The house was beautiful and our group of eight loved it. Jackie and Javier were very helpful and nice. Jackie especially was at our beck and call for any problems or concerns. HOWEVER, we were very disappointed to arrive to an ice maker that made about 10 cubes of ice a day and a freezer that took a day to make a tray of cubes. It cost use about $20 just to get some bags of ice to use the fist day since we didn't rent a car and had to send for it. Additionally, the oven didn't work at all. Only one side of the toaster worked, but they did replace that within a day or two. About halfway though our stay the microwave also broke and wasn't replaced until the day we were leaving. The roof leaked in several places and a fan in the larger of the main floor bedroom makes a banging noise that makes sleep difficult. All in all, I think we just had some bad luck. We certainly made the best of it and still had a wonderful vacation, but all of the problems certainly made things inconvenient. I think the ice situation should have been taken care of without a charge to us. Perfect place to spend a family vacation! The pictures on the website do not adequately show how great this house is. It far exceeded our expectations. The rooms are spacious. The view is terrific. Jackie, the caretaker, is wonderful and does a great job of keeping the house in order and answering any questions. We had 3 families and 2 babies and had a most memorable vacation. We would love to come back. Thanks for the perfect score. We tried and tried to get pictures that do the house justice but that's past our skill level. It was always a great house, but the new owners have taken it to an even higher level. Come back real soon. We have found how and where we want to travel to Mexico going forward. Staying at Villa Yak'alil was truly a memorial experience. The house is fantastic and Yackie makes it all the better. Make sure to do the cooks service and we recommend Edna! We'll be back for many years to come! Cannot wait until next year!! This is an extrodinary home - every bedroom is fantastic! Two weeks of Mexican food was a bit much - perhaps every other day would have been better. Our ccok was great, the house well managed. MUST get the ice maker fixed!!! Phone to US did not work, internet very, very slow. Property landscaping was very well maintained on daily basis, house was kept very clean daily. This property is a great value for its cost and can sleep 8 adults very easily plus a few kids. The staff and property was fabulous. We couldn't have been treated better. Luis the cook was awesome. I have already recommended it to others from Idaho and we are planning our next trip back asap. Thank you for a great trip. Great place to stay with family or friends. I wished I could have stayed longer than a week. I would recommend this house to my friends. You definetly need to rent a car but it is very easy to get around Cozumel. The view was spectacular, the house lovely, the caretaker and her son delightful. We had a very nice stay and became quite taken with the caretaker and her son. They were just delightful. We did have a series of electrical and redridgeration problem that made things a little tense but the caretaker Jackie worked hard to resove these as did the property manager. We had a wonderful time Villa Yak'alil. The home is wonderful and the location is beautiful! I can't wait to go back! We are already talking about renting "our" villa again next year. It was a wonderful experience. Much cleaner (I'm fussy)and much more beautiful, than I thought it would be. Jackie was wonderful and was very helpful with hiring boats and giving advice.